October overview: If a Martian who knew a little about movies landed in a multiplex parking lot and wandered inside, he'd realize pretty quickly from what's playing that it must be October. Big commercial movies targeted to adults rather than to summerfanboy audiencesare what Hollywood puts into the October marketplace. Frequently, they're from high profile filmmakers and have goods awards potential. 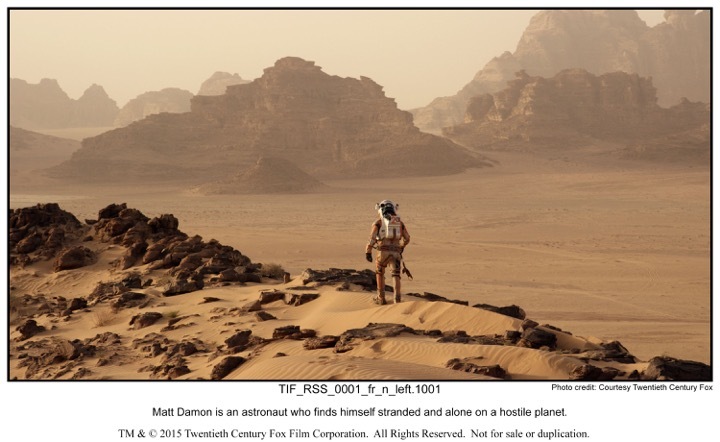 Our Martian, by the way, would probably stick around to see one of October's first wide releases -- 20th Century Fox and Scott Free Productions' PG-13 rated 3D sci-fi action adventure "The Martian," opening Oct. 2 at about 3,750 theatres. Directed by Ridley Scott ("Gladiator"), it stars Matt Damon, Jessica Chastain and Kristen Wiig.Like most sci-fi films, "Martian" should play best to adult males. "Martian" director Ridley Scott's many other credits include the hits "Alien," "Blade Runner"and "Hannibal." Scott is a three time best directing Oscar nominee – in 1992 for "Thelma & Louise," in 2001 for "Gladiator" and in 2002 for "Black Hawk Down." With Scott's credentials, you can expect Academy members to make time to see"Martian"where they might not bother to see a sci-fi story from a less prestigious filmmaker. With so many awards hopefuls, just getting seen by the voters is a huge advantage. In "Martian,"astronaut Mark Watney (Damon) is presumed dead after a fierce storm during a manned mission to Mars and is left behind by his crew. But Watney, who's managed to survive, signals Earth that he'sstranded and alive. While NASA and a team of international scientists work tirelessly to bring "the Martian" home, his crewmates plot a daringrescue mission. A good indication of Hollywood's expectations for "Martian's"invasion of the boxoffice is that only one other wide release is going up against it this weekend. That film is Lionsgate,Thunder Road Pictures and Black Label Media's wide expansion of the R rated crime drama "Sicario," which has been playing in limited release. Directed by Denis Villeneuve ("Enemy"), it stars Emily Blunt, Josh Brolin and Benicio Del Toro. "Sicario," which means hitman, is set in the lawless border area between the U.S. and Mexico. Its story centers on an idealistic FBI agent (Blunt) enlisted by an elite government task force official (Brolin) to help in the escalating war on drugs. Besides appealing to the male action fans, "Sicario" could also see interest from under-25 females because its central character is a young female. Two wide releases hit the multiplexes Oct. 9. Warner Bros. and RatPac-Dune Entertainment's PG rated 3D fantasy adventure "Pan" is directed by Joe Wright ("Atonement") and stars Hugh Jackman, Levi Miller and Jimmy Vee.It should play best to family audiences, especially moms-with-kids. "Pan" focuses on the beginnings of the beloved characters created by J.M. Barrie for his classic book "Peter Pan." Peter (Miller), a mischievous 12-year-old with a rebellious streak, has lived his whole life in a bleak London orphanage where being rebellious is not considered ideal. One incredible night, Peter is whisked away from the orphanage and spirited off to a fantastical world of pirates, warriors and fairies called Neverland. In Neverland, Peter teams up with the warrior Tiger Lily (Rooney Mara) and a new friend -- James Hook (Garrett Hedlund). Now Peter must defeat the ruthless pirate Blackbeard (Jackman) to save Neverland and discover his true destiny -- to become the hero to be known as Peter Pan. TriStar Pictures and ImageMovers' PG rated 3D biographical adventure drama "The Walk" is directed by Robert Zemeckis ("The Polar Express") and stars Joseph Gordon-Levitt, Charlotte Le Bon and Ben Kingsley. With its PG rating, "Walk" is targeted to family audiences. "Walk" started in limited release Sept. 30 at about 300 theatres. Zemeckis won the best directing Oscar in 1995 for "Forrest Gump" and is the kind of high profile filmmaker whose new movies typically attract interest from and get seen by Academy members. Although 12 people have walked on the Moon, only one person -- Philippe Petit (Gordon-Levitt) -- has ever, or will ever, walk between New York's World Trade Center towers. Guided by his real-life mentor (Kingsley) and aided by an unlikely band of international recruits, Petit and his gang overcame long odds, betrayals, dissension and countless close calls to conceive and execute their mad plan. Oct. 16 will begin a crowded movie weekend with four wide releases. Universal and Legendary Pictures' gothic romance "Crimson Peak,"from "Pan's Labyrinth" director Guillermo del Toro, stars Mia Wasikowska, Jessica Chastain and Tom Hiddleston. Like most horror films, it should play best to under-25 females. Although Halloween is about two weeks later, "Crimson"should benefit from being in the scary friendly pre-Halloween marketplace. In "Crimson" a young woman (Wasikowska), whose heart is stolen by a seductive stranger, is swept away to a house high on a mountain of blood-red clay whose secrets will haunt her forever. 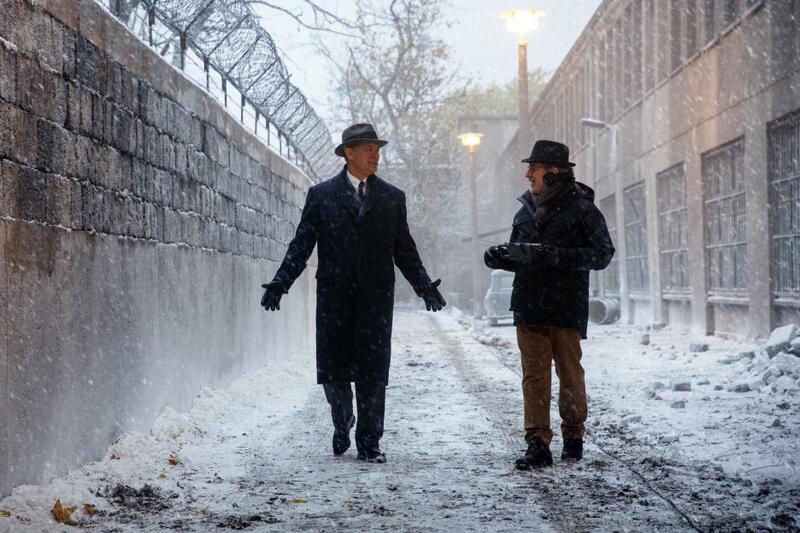 Three time Oscar winner Steven Spielberg's ("Saving Private Ryan") PG-13 rated dramatic thriller "Bridge of Spies" is presented by DreamWorks Pictures, Fox 2000 and Reliance Entertainment and is being released through Touchstone Pictures. Starring are: Tom Hanks, Peter McRobbie and Alan Alda. It should play best to men and women over-25. Any film from Spielberg or with Hanks is automatically an Oscar contender and one that Academy voters will certainly make time to see. Spielberg won the best directing Oscarin 1999 for directing "Saving Private Ryan," and won best picture and best directing in 1994 for "Schindler's List." Brooklyn insurance lawyer James Donovan (Hanks), who's thrust into the center of the Cold War when the CIA sends him to East Berlin to negotiate a captured American U-2 pilot's release. Columbia, Sony Pictures Animation and Village Roadshow Pictures' PG rated 3D action adventure comedy "Goosebumps" is directed by Rob Letterman ("Gulliver's Travels") and stars Jack Black, Odeya Rush and Halston Sage. It's targeted to family audiences and is also well suited to pre-Halloween release. In "Goosebumps," teenager Zach Cooper (Dylan Minnette) is unhappy about moving from a big city to a small town, but cheers up when he meets his beautiful new neighbor, Hannah (Rush). Hannah's strange dad turns out to beR. L. Stine (Black), author of the bestselling Goosebumps books. Stine is a prisoner of his own imagination because the monsters he writes about are real and he protects his readers by keeping them locked up in their books. When Zach unintentionally unleashes the monsters, they terrorize the town and Stine, Zach and Hannah must get them all back into their books. Lionsgate's PG-13 rated drama "Freeheld" goes wide Sept. 16 after opening in exclusive engagements Oct. 2. Directed by Peter Sollett ("Nick and Norah's Infinite Playlist"), it stars Julianne Moore, Ellen Page and Steve Carell. It should play best to adult women. "Freeheld," based on the 2008 Oscarwinning documentary short directed by Cynthia Wade, is the true love story of Laurel Hester (Moore) and Stacie Andree (Page) and their fight for justice. After Hester, a decorated New Jersey police detective, is diagnosed with cancer, she wants to leave her pension to Andree, her domestic partner, but county officialscalled freeholders prevent that. With help from a tough detective (Michael Shannon) and a local activist (Carell),police officers and ordinary citizens rally to support the women's struggle for equality. The logjam of new wide releases continues Oct. 23 with six films entering the pre-Halloween marketplace. Universal, Legendary Pictures and Scott Rudin Productions' R rated biographical drama "Steve Jobs" is from Oscar winning "Slumdog Millionaire" director Danny Boyle. Starring are: Michael Fassbender, Kate Winslet and Seth Rogen. "Jobs," which began playing exclusive engagements Oct. 9 and went into limited release Oct. 16, is another October release that could wind up in the Oscar race, including for best picture and directing, It should play best to adult men and women. Boyle is another high profile director with an Oscar to his credit and that should definitely help "Jobs" get seen by Academy voters. Fassbender was nominated for best supporting actor in 2014 for "12 Years a Slave," but lost to Jared Leto for "Dallas Buyers Club. "Fassbender is a likely best actor nominee this time around for his performance as pioneering Apple founder Steve Jobs. Fassbender delivers an intimate portrait of the brilliant man at the epicenter of the digital revolution. Winslet isformerMacintoshmarketing chief Joanna Hoffmanand Rogen plays Apple co-founder Steve Wozniak. The film's screenplay by Aaron Sorkin is adapted from the book by Walter Isaacson. Sorkin won the best adapted screenplay Oscar in 2011 for "The Social Network" and is a likely contender now in the same category for "Jobs." Paramount and Blumhouse Productions' 3D horror thriller "Paranormal Activity: The Ghost Dimension"is directed by first time feature director Gregory Plotkin and stars Chris J. Murray, Brit Shaw and Ivy George. Its pre-Halloween release is perfect timing. "Ghost" should play best to under-25 females, the usual core audience for horror films. A week later, it also should attract teen couples on Halloween movie dates. In the franchise's sixth episode, a new family and their young daughter move into a house where they find a video camera and a box of old tapes in the garage. While looking through the camera, they -- and moviegoers, for the first time -- can actually see the supernatural activity around them. "Paranormal Activity 4,"the last episode in the franchise that connects best with the new film, opened Oct. 19 2012 to $29 million and went on to do $53.9 million domestically. Universal, Blumhouse Productions and Hasbro's PG rated fantasy adventure drama "Jem and the Holograms" is directed by Jon M. Chu ("G.I. Joe: Retaliation") and stars Molly Ringwald, Juliette Lewis and Ryan Guzman. It should play best to under-25 females. In "Jem's" story a small-town girl springboards from being an underground video sensation to emerging as a global superstar. It's then that Jem and her three sisters learn that some talents are too special to hide. Open Road Films and Dune Films' comedy with music "Rock the Kasbah" is directed by Barry Levinson ("Man of the Year") and stars Bruce Willis, Zooey Deschanel and Bill Murray. It should play best to under-25 men and women. "Rock" is about a down-on-his-luck music manager who while visiting Afghanistan discovers a teenage girl with afabulous voice and brings her to Kabul to compete on the hit TV show"Afghan Star." The Weinstein Company and 3 Arts Entertainment's comedy drama "Burnt"is directed by John Wells ("August: Osage County") and stars Bradley Cooper, Sienna Miller and Omar Sy. It should play best to adult men and women. Cooper plays Adam Jones, a two-star Michelin chef who had it all and lost it all thanks to drugs and bad behavior. To land his own kitchen now and get that elusive third Michelin star, he must have the very best on his side – and, especially, the very beautiful Helene (Miller). Summit Entertainment's PG-13 rated action adventure fantasy "The Last Witch Hunter" is directed by Breck Eisner ("The Crazies") and is another of this weekend's titles that's well suited to pre-Halloween release. Starring are: Vin Diesel, Rose Leslie and Elijah Wood. It should play best to 25-plus male action movie fans. One of the modern world's secrets, according to "Last," is that witches still live among us and for centuries have battled armies of witch hunters. Diesel plays Kaulder, the warrior who killed the all-powerful Queen Witch. While dying, the Queen cursed Kaulder, forever separating him from his wife and daughter in the afterlife. Kaulder, who is now the last of his kind, has spent centuries hunting down rogue witches. When the Queen Witch is unexpectedly resurrected, she seeks revenge on her killer. The ensuing epic battle will determine whether the human race survives. The month wraps up Oct. 30 with two wide releases. Paramount and Broken Road Productions' R rated horror comedy "Scout's Guide to the Zombie Apocalypse" is well timed for Halloween release. Directed by Christopher Landon ("Paranormal Activity: The Marked Ones"), it stars Patrick Schwarzenegger, Halston Sage and Tye Sheridan. It should play best to under-25 females, some of whom are likely to drag boyfriends along for Halloween dates. In "Zombie," three scouts discover the night before their last camp-out what true friendship is all about when they must try to save their town from a major crisis -- a zombie invasion. 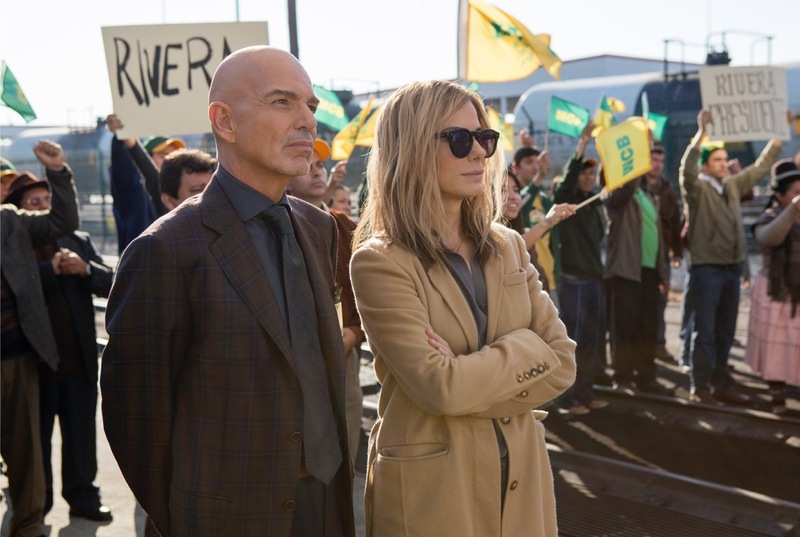 A different kind of crisis is at the heart of the story in the comedy drama "Our Brand is Crisis" from Warner Bros., Participant Media and Smokehouse Pictures. Directed by David Gordon Green ("Manglehorn"), it stars Sandra Bullock, Billy Bob Thornton and Zoe Kazan. It should play best to adult men and women. "Crisis," a feature film based on Rachel Boynton's 2005 documentary "Our Brand Is Crisis,"examines the use and consequences of using American style political campaign strategies in South America. Bottom line:October will benefit from having a holdover hit in the PG rated 3D animated monster comedy adventure "Hotel Transylvania 2" from Columbia and Sony Pictures Animation. With its $47.5 million opening last weekend – the biggest September opening ever -- "HT2" should scare up monster ticket sales in the coming weeks, benefiting from moviegoers' pre-Halloween appetite for scary-type movies. It's the kind of film moms will take kids to see because it fits in so wellwith the spirit of celebrating Halloween. That could mean kids dressing up as little monsters to see the film. And everyone will be thinking about Halloween starting in early October because that's when marketers now start promoting the holiday.